A Guest Post by Adam Chilton. The above figure presents our primary results. The top left panel shows that members of the human rights bodies consistently had worse records than the other UN members from 1998 to 2013 (eight years before and after the 2006 reform), but the gap did close a little after the creation of the HRC in 2006. Since the elections to the human rights bodies occur by region, the rest of the panels show the results by UN region. They reveal that in some regions the 2006 reform largely closed the gap (e.g. 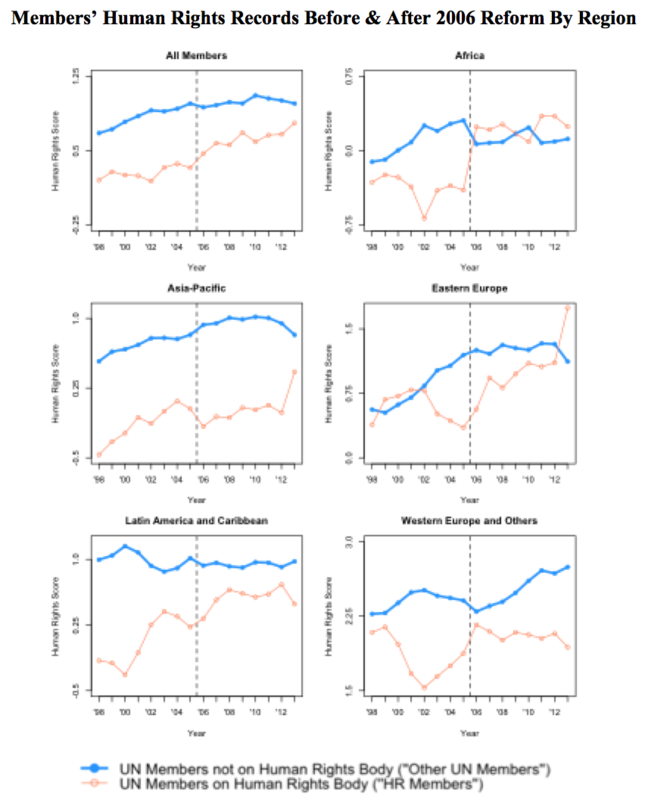 Africa), but in other regions the effects were much more modest (e.g. Asia-Pacific). Why does the gap persist? In the paper we show that when there are contested elections, countries with better human rights records typically win. The problem is that—perhaps because they think they won’t win or don’t care about being a member—countries with good human rights records frequently aren’t candidates in the elections for these bodies. Previous PostRights Without ResourcesNext PostWhat does Trump mean for international human rights law?